For nearly a century, Denver's Union Station, situated at 17th and Wynkoop Streets in LoDo (map), served as Denver's gateway. After suffering neglect in the 60s and 70s, a group called Save Our Station came forward to save Denver's landmark and stood in the gap until LoDo's redevelopment in the 90s. Today, with FasTracks and a "project authority," Denver Union Station is primed to become the city's transportation star once again, juiced with hospitality and shopping opportunities that Denver's founders would dismiss as flights of fancy. ⊗ Mid-February 2014, in a blizzard of track-work, the "cut-over" will take place, re-connecting Tracks 4 and 5 with the national railway network. Amtrak trains currently use Track 8. Station activities will be moved into the historic building. This will begin a new period of awkwardness, due to the surrounding construction activities, with special efforts needed to define safe pedestrian routes. While RTD is mainly concentrating on the next step, national interest is focused on the Amtrak move, after relocations in both Miami and St. Paul were fouled up. One ColoRail member riding on the Southwest Chief found himself being grilled by his sleeping car attendant as to whether Denver would be able to handle this in a timely manner or not. ColoRail board members receive many questions along the same lines. At this phase, customers should have access between the 16th Street FREE MallRide and the Wynkoop entrance to the historic building, or a 3-block walk up 17th Street for Market Street Station connections with skyRide and Boulder-Longmont buses. Thruway buses will have to park along Wynkoop Street during this stage of the project. ⊗ On May 9th, a big grand opening ceremony will be held for the Bus Concourse, which is to link the thousand foot walk between the historic building and the relocated light rail platform. Amtrak Thruway bus connections for Colorado Springs, Pueblo, Walsenburg, Trinidad, and Raton. For the future, at least two other bus companies have expressed interest in serving the station. On the other hand, residents of Lower Downtown, recipients of millions of tax dollars in the form of a landscaped plaza in front of the historic building that replaces the taxi and bus loop, are objecting to "increased" bus traffic. Actually, there is no LoDo increase, but the project changes which streets are used, as buses would no longer be going to Market Street Station. 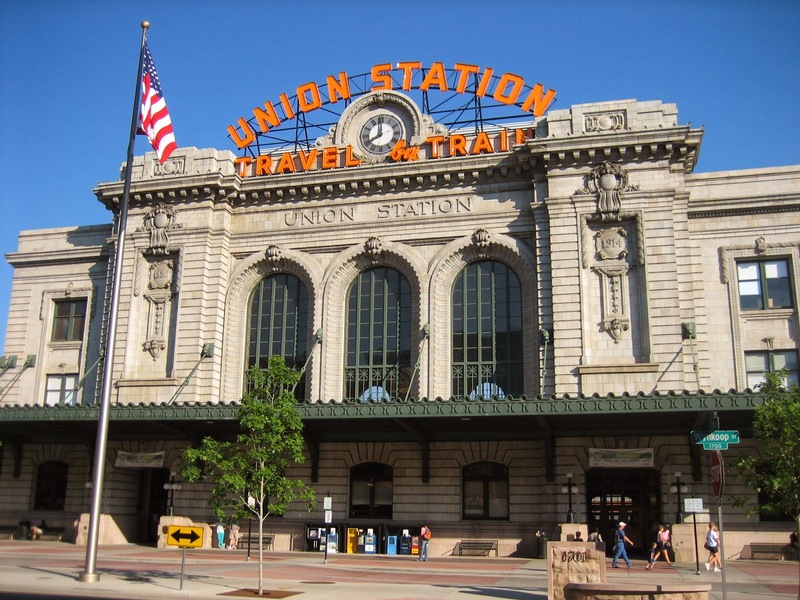 ⊗ On or about October 1st, CDOT expects to begin interdistrict commuter bus service between Fort Collins, Denver and Colorado Springs, with stops at Union Station. ⊗ In 2016, three commuter rail lines are due to begin service, including the DIA/East Line, the Westminster Line, and the Gold Line (Arvada - Wheat Ridge). These would replace several Express bus routes in Union Station, as well as the Rte AF skyRide coaches. Also improved would be connections to Aurora, via the I-225 light rail extension. Aurora stops will be accessible either via an East Line transfer at Peoria/Smith Station or via a C/E-Line to H-Line transfer at I-25 & Broadway Station.